It only requires a camera system capable of capturing a dumbfounding number of frames per second — 10 trillion fps. That’s 10,000,000,000,000 pictures per second. The speed of light is essentially instantaneous until you start getting really, really far away. (For instance, it takes the light from our sun just under 8 1/2 minutes to make the 93,000,000 mile journey to Earth.) And yet, nearly every sci-fi film or show ever made that features characters firing laser weapons also has characters dodging the shots aimed at them. When you combine geometry with the developing science of 3D-printed flexible materials and components, the old rules of design stop being so rigid themselves. Aircraft wing designs have forever used moving flaps and ailerons to make a single wing that is the compromise of the best wing designs for the different modes of flight (takeoff, ascent, level flight, maneuvering, descent, landing). Now, instead the whole wing itself can alter its fundamental shape to produce the optimal wing characteristics for whatever the pilots needs the aircraft to do in the moment. It’s not new news that there is an ever-growing collection of man-made objects in orbit around the Earth that could potentially be a problem. As of 2013, NASA put the number of trackable objects in orbit at over 500,000. Yes, that’s a lot, and it looks frightening when a you see an image like below representing them all. But, keep in mind, those white dots aren’t to scale. There’s a lot more room up there in space than that. And yet … there are multiple companies all with plans in the works to launch thousands of satellites in order to create an orbital blanket of high-speed, broadband internet access to cover the globe. Amazon’s Project Kuiper calls for 3,236 satellites in low-earth orbit, while SpaceX aims to put 11,943 small satellites up into the sky. All of which makes the fireworks show put on by India last week so concerning. In showing off its military capability in launching a projectile from Earth into a satellite in orbit, the Indian test created a massive debris cloud that isn’t clogging up the orbital tracks to provide access to the internet to the rest of the world. India said it’s test was designed to keep the debris cloud in the lower-earth orbital altitudes so as to not endanger the International Space Station (which orbits at an average altitude of 240 miles). 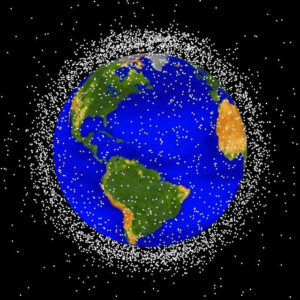 Even so, NASA has already identified two dozen trackable pieces of debris at an altitude higher than the highest points of the ISS’s orbit. Reading this Bloomberg News investigative piece about YouTube’s problem with the toxic content flourishing on their platform feels familiar. It’s a story that is quite damning of the leaders of YouTube and Google, specifically: avoiding the steps necessary to fix a known problem that was causing harm to their users, all because dealing with the problem would cause the company to lose the revenue that came from the users suffering those consequences. It doesn’t sound too dissimilar to the allegations levied against the tobacco companies in the 1990’s: that they knew their product was harmful and addictive to their customer users, but ignored and even actively hid the problem in order to continue to collect the billions in revenue dollars that the harmful product produced. Trust me: someone somewhere is building a case aimed at the nearly bottomless pockets of the Silicon Valley Tech Titans who have run the same playbook as YouTube here.